We’re excited to share that Édouard Manet’s Spring (Jeanne Demarsy), acquired by the Getty Museum last month, has gone on view in the Impressionist gallery at the Getty Center. 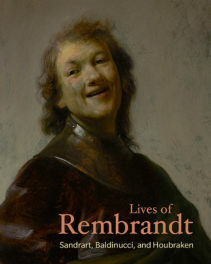 In advance of the work’s auction in New York on November 5, acting Paintings Department head Anne Woollett and assistant curator Peter Kerber and I went to see it in person. We were instantly bowled over by this gorgeous painting. Boasting remarkably varied brushwork and a bold yet sophisticated sense of color, it both compelled attention from a distance and amply rewarded close looking. 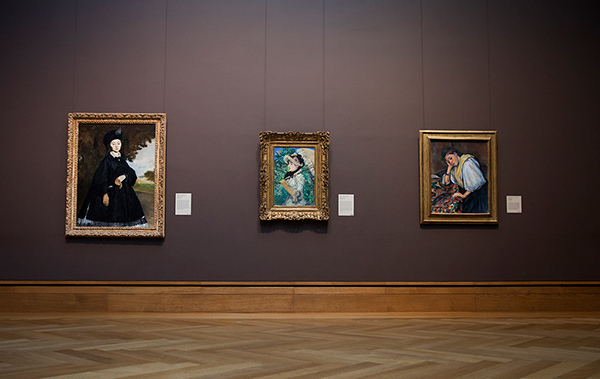 We couldn’t help but imagine how the picture would introduce a vital, wholly feminine presence to the museum’s Impressionist gallery—and indeed how it might easily become one of the most iconic works of the collection. We knew, moreover, that this was the last Salon painting by Manet to remain in private hands, and that its sale represented an extraordinary opportunity that wouldn’t likely be repeated. We have to go back to the early twentieth century to find works of this caliber by Manet on the market. Indeed, had the great art collectors Louisine and Henry Osborne Havemeyer bought Spring from the legendary French dealer Paul Durand-Ruel in 1909 instead of their friend Colonel Oliver H. Payne (1839–1917), in whose family the painting would remain for over a century, it would have entered the collection of New York’s Metropolitan Museum of Art as part of the monumental Havemeyer bequest in 1929! But we also knew that works of this stature and rarity have gone for double or triple their auction estimates in recent years, and that, were we to contend seriously for the painting, we’d have to be prepared to be aggressive. The Getty was extremely fortunate to secure the painting thanks to the enthusiastic support and decisive action of the Board of Trustees, Trust president Jim Cuno, Museum director Timothy Potts, and associate director of collections Thomas Kren. By moving permanently from private hands into a public collection, the painting becomes accessible to millions of visitors to enjoy. 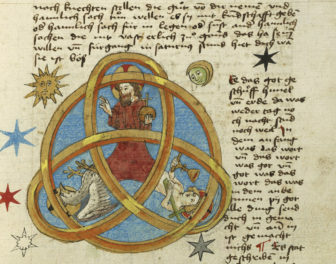 And once photographed and added to our online collection, it will enter the Getty’s Open Content Program, free for digital download to website visitors around the world. Needless to say, the excitement is running very high at the Museum! 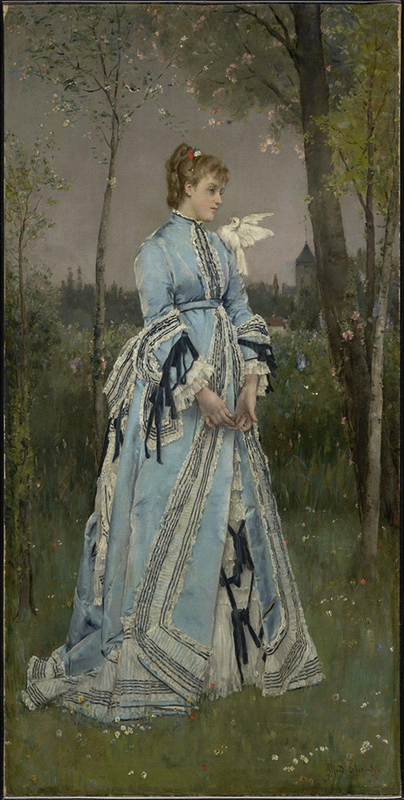 The painting portrays the young actress Jeanne Demarsy, born Anne Darlaud (1865-1937), as the fashionable embodiment of Spring. 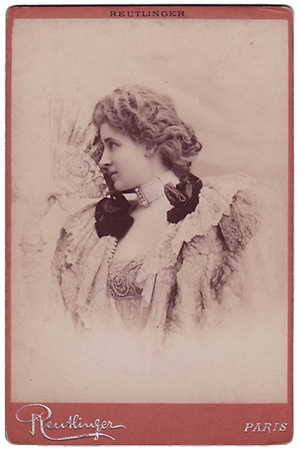 It constituted her smashing public debut when it was exhibited in the 1882 Paris Salon, some five years before she achieved a passing moment of fame on the Parisian stage in her role as Venus in an 1887 production of Offenbach’s Orphée aux enfers. 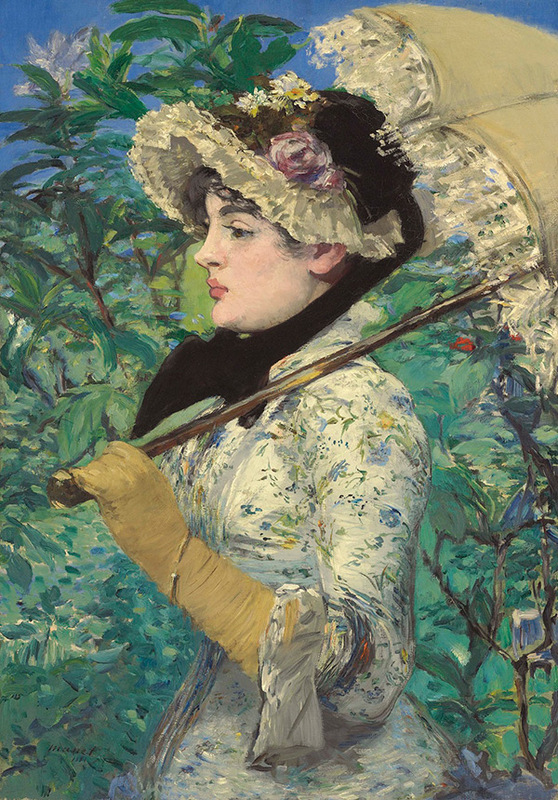 An avid connoisseur of feminine fashion, Manet had been busy playing couturier early in 1881, visiting the establishments of reputed modistes for hats and dresses in which to portray the beautiful young Jeanne, whom he had already depicted in a few casual pastels and unfinished pictures. Now she was to be the subject of an important exhibition piece, and the aesthetic stakes were high. He settled on a spring ensemble comprising a white, form-flattering dress colored with delicate floral accents, long camel-colored suede gloves, a ruffled bonnet ornamented with blossoms and tied with a broad black bow, and a dainty parasol. He then had her pose formally in his studio, as per his usual practice. The final picture, resulting from many sessions of painstaking work, presents her in sharp profile against a dense, luxuriant backdrop of rhododendrons offering a glimpse of cobalt blue sky. Manet took particular care in describing the silhouette of her dress and defining her brow, eyelids and lashes, upturned nose, full lips, and rounded chin. Comparing Manet’s portrayal to known photographs, we can see how he modified her features, the nose in particular, to make her over as the archetypal Parisienne, coquettishly pretty and pert. She is fully aware of viewers’ admiring gazes even as she remains a perfect study in poise and detachment. Spring resonates with various worlds of imagery, familiar and exotic, high and low, past and present, ranging from depictions of courtesans in 19th-century Japanese ukiyo-e prints to fifteenth-century Italian portraits of noblewomen. It simultaneously evokes a burgeoning industry of commercial fashion-plate advertising and picks up on an emerging vogue among painters for portraying fashionable women as thinly veiled allegories of the seasons. Manet was mindful of a Summer and Winter pair exhibited by Berthe Morisot in 1880 and a full seasonal cycle executed by the popular Belgian painter Alfred Stevens in 1869 and then profitably reprised in 1877/8. The success enjoyed by Stevens’ work encouraged Manet in this vein and may have prompted his longtime friend Antonin Proust to suggest the idea of a series of the seasons to him in the first place. Besides Spring, which would later come into Proust’s possession, Manet painted only one other work in the projected series: a portrait of the demimondaine Méry Laurent as Autumn, which is today in the Musée des Beaux-Arts, Nancy. About ten years Jeanne Demarsy’s senior, Méry was well suited to represent for Manet a more advanced stage, or “season,” of womanhood. Unfortunately Manet never had a chance to complete the series. He died in 1883 at the age of 51, having fallen victim to the ravages of syphilis like so many men of his generation. Spring was shown in 1882 at the Salon (the predominant annual art exhibition in Paris) along with Manet’s spectacular and controversial Bar at the Folies-Bergère, which was the subject of an exhibition at the Getty Museum in 2007. Spring was perhaps the most resounding success of the painter’s long and notorious Salon career. 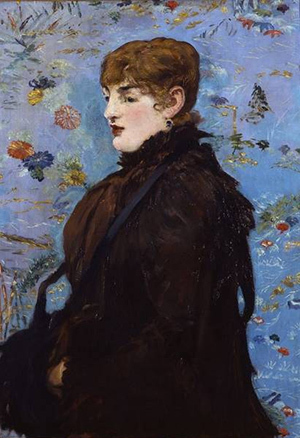 Progressive and conservative critics alike found Jeanne utterly charming and exquisite and readily described her as a seductive “bouquet” and the painting as a “gem.” They lauded Manet for perfectly capturing the chic type and character of the modern Parisienne, brilliantly fashioned for public display and insouciant amatory slaughter. And while the painting exhibited the artist’s typically bravura handling and a high-keyed modern palette, it was also, for Manet, an unusually finished piece of work that exhibited real mastery in the handling of skin and flesh tones. However popular its appeal as a subject, fashionable femininity was no frivolous matter for Manet. 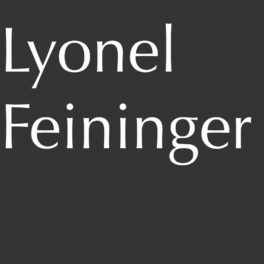 Indeed, with its elaborate ruses and artifice, fashion and the female toilette were, for him, metaphors for the skilled artifice of painting itself. Few other works by Manet so clearly speak to the fruitful exchange between female fashion and avant-garde painting in late nineteenth-century France (an exchange that was recently the focus of the brilliant exhibition Impressionism, Fashion, and Modernity organized by the Art Institute of Chicago, the Metropolitan Museum of Art, and the Musée d’Orsay). Spring goes to the very heart of Manet’s conception of modernity and answers the challenge issued decades earlier by Charles Baudelaire in his epochal essay “The Painter of Modern Life,” in which modern Parisian womanhood is evoked as a vast uncharted territory still awaiting its dedicated historian, the painter who could somehow magically transmute the contingency of ephemeral fashion into an eternal ideal of art. With its awareness of Old Master antecedents, this is a painting that from the very beginning had its eye on the museum and the great artistic traditions it represents, even as it advertises its up-to-the-minute fashion-plate chic. Perhaps it’s appropriate that Spring, Manet’s artful homage to beauty and youth, has ended up in Los Angeles. Just saw Manet’s allegory “Spring” today with tour guide Gail. It is truly exquisite. What a treat. Loved how we could compare her to the portrait done 20 years earlier, Mme Brunet, in the same room.